Last week our good friend Kristin Nicholas invited everyone at Classic Elite Yarns out to her farm for a lesson in color work. We all jumped at a chance to go out and see the sheep…I mean her. Kristin lives with her family on a working farm in Leyden, MA. It was a nice drive out these (especially since I wasn't driving and could knit in the back seat), and even though we were in the middle of a heatwave here in Eastern Massachusetts, it was much cooler in Western Mass. Leyden Glen Farms had just shorn the yearlings for the first time the day before we arrived, so we were greeted by a big pile of raw wool! We began the day with Kristin leading a discussion on colors and how they work together. She showed us some artwork by famous artists and explained how they used color to achieve the look they were going for. We then ventured down into what I am dubbing the ‘Color Studio’. Kristin showed us some of her past sweater designs and why they were so successful because of her use of colors. Kristin had picked some flowers out of her garden to illustrate how many colors there are all around us that we take for granted. She gave us each a flower and we picked yarn to match the colors in the flower. It was amazing how when you truly looked at the flower, instead of just seeing a pink flower on a green stem, you saw many many colors. I love how we were all using the same yarn and techniques, but we each got something different and amazing. After a hard day’s work of playing with yarn, Kristin gave us a tour of her house and showed us how she used color in her home décor. And I couldn't help sneak over to where the sheep and chickens were and snap a few shots. All and all, it was a great day of fun. Oh, and we may have stopped for ice cream on the way back. Thanks Kristin! Liberty Wool Light...now available in Solids! There are so many awesome things about working for a yarn company. Seeing new patterns before they are introduced, touching yarn any time you want, being surrounded by other yarnies, talking to knitters and LYSs and much more. But the best thing? It has to be seeing the new yarns from the mill. The hardest part of working for a yarn company? Not being able to shout from the rooftop that we have new yarns until they are released. But today, I have the honor of sharing with you one of our newest family members – Liberty Wool Light Solid. 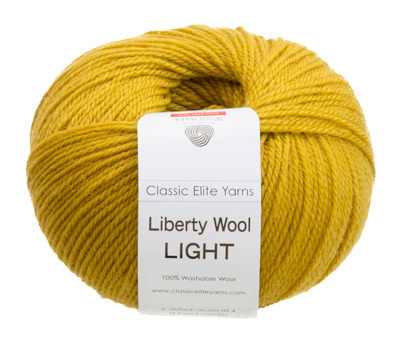 I was so excited when I found out that we were going to be doing Liberty Wool Light in solid colors. I love using Liberty Wool* - whether the worsted or light version. I love that it's machine washable, which makes it perfect for sweaters, toys, baby clothes, blankets/afghans, socks, hats, scarves…I think you get the idea. We also have a dedicated booklet for Liberty Wool Light (Spectrum), which features both the print and solid yarn. There are a couple of pullovers, a cardigan and a few scarves in the book. All the patterns are up on Ravelry and available in local yarn shops (we just began sending the booklets out, so if your LYS doesn't have it yet, they will soon). I can't wait to see all of the wonderful things you guys are going to be making with Liberty Wool Light Solid! *A while back I asked Betsy, the owner of Classic Elite Yarns, why Liberty Wool got its name. I had visions of it being named that because CEY is based in New England where so many people fought for the freedoms we enjoy. “No,” she explained “it’s because it liberates you from hand washing your sweaters.” I like that. When my friend announced that she was having a baby, I was filled with glee. Not just because I was so happy for my friend and her fiancé, but because that meant I got to knit something for the wee one. My friend is a knitter and has lots of other knitting friends, so I knew that she would be getting lots of knitted gifts for her first born son. I also knew that meant I needed to pick something that would be extra special. I thought about a blanket, but I had heard through the grapevine that she was getting a blanket as a group gift from some of the other knitters. I also thought about a sweater, but he was expected last week and it would be too hot for him to wear a sweater right off the bat. So I settled on a stuffed toy. I had made the Monkey Jacobus by Annita Wilschut for my nephew a few years ago and it was a hit, so I knew this was the pattern I was going to knit. I absolutely LOVE this pattern. It is knit all in the round, which means no sewing of tiny parts when you are done! The thought of doing intarsia for the face in the round scared me to death, but her directions and photos make it not only crystal clear…but a snap to knit. I use Liberty Wool Print in color 7821 Caribbean Tidepool, which is a great baby boy color. It is made up of blues and greens. It’s one of those colors that isn’t too soft or too bright. I decided to not try and match up the prints too much and just let the yarn do what it wanted to do. And I love the way that each of the monkey's appendages are different colors because of that. I think it gives the little guy a sense of whimsy. For the face and paws I used Liberty Wool Solid in 7836 Taupe. I wanted something that would coordinate well with the print, while standing out on its own. I found some scraps of a dark orange to make the mouth and some dark brown to embroider the eyes (safety first – nothing that the wee one could possibly pull off and put in his mouth). And since he is made from Liberty Wool, my friend can pop the monkey in washing machine when he gets dirty. I really hope that the yet-to-be born little boy loves the monkey as much as I do and that they become best buds. P.S. Wee one – you were supposed to come last week. I think your mom would appreciate it if you made an appearance soon!